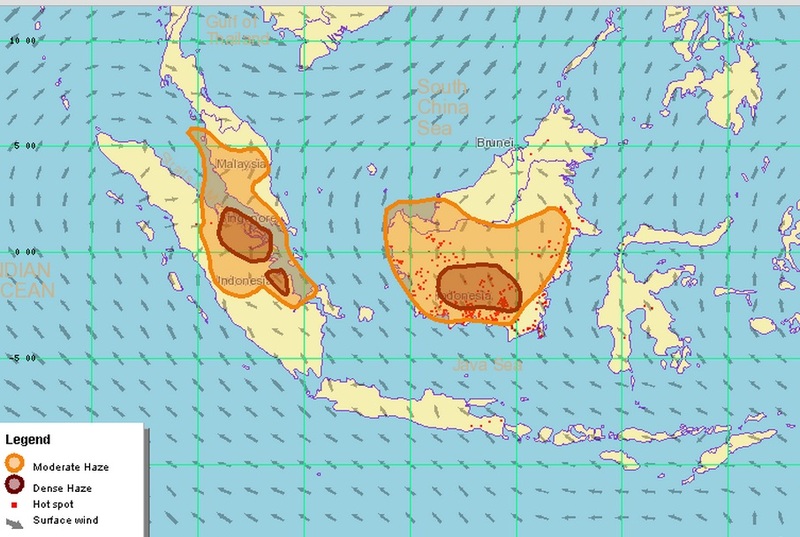 I'm Curious Too: The Annual Haze in South East Asia: Whose Fault Is It? The Annual Haze in South East Asia: Whose Fault Is It? Even breathing can be difficult nowadays. 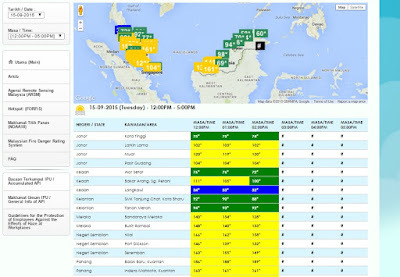 A lot of us are well-informed about the haze that hit South East Asia (SEA) every year. In fact, it's happening right out the window next to me as I type, and if you don't know about it already, you should really go hang yourself outdoor once in while and stop keeping yourself indoor all the time. The SEA haze phenomenon is an annual occurrence, like some sort of annual carnival that happens every summer, except it involves a lot more fire, smoke, and a lot of forest burning. It is the result of the slash-and-burn practice of Indonesian farmers to clear the forest for agricultural development. Apart from small land owners and nomadic farmers, large concessions like oil-palm, logging and timber (for wood pulp and paper) companies also use fire to achieve similar objectives. It's been happening for as long as I can remember and despite not becoming more severe since 1997, the situation hasn't been improving either. Every year during the dry season, Malaysians and Singaporeans wait in despair for the haze to arrive to blanket the cities and suffocate the citizens with toxic gases. The president of Indonesia, past and present, had pledged to tackle the problem, but the problem persists to this day. The haze, however, is not a recent issue: I was quite surprised when I learned that severe haze such as the ones we are having today had occurred back in the early 1900s. In 1846, for example, an extensive swamp-forest fires broke out in a remote and apparently uninhabited part of Central Kalimantan during a drought. During the severe El-Nino-triggered drought of 1877-1878, fires occurred in West, Central and East Kalimantan. Widespread fog blanketed parts of Borneo during another drought in 1902, which could indicate burning. The exact cause of fire for these cases, however, could not be determined due to the lack of evidence. The earliest evidence of human-caused burning was recorded in 1915, when fires that escaped from farmers' fields lit logging debris and destroyed about 80,000 hectares (an area bigger than the island of Singapore) of forest in an area south of Mount Kinabalu in Sabah. Known as the Sook Plain, the burned area lost all of its trees and remained as Imperata grassland ever since. Fast forward to 1972, Chia (1979) described a "very extensive haze" between the months of August and October over Singapore, Malaysia, Eastern Sumatra, Java, and Kalimantan. He attributed this to the "burning of forest trees by shifting cultivators in Sumatra and Kalimatan." There are several reasons why the haze persisted over the years, and a lot of it has to do with (1) recalcitrant farmers/companies and (2) the climate of SEA. Farmers and large concessions are the two primary contributors of forest fire in Indonesia. The farmers, however, play a much bigger role than the large companies. A study published in August 2015 shows that 59 per cent of fire emissions originate from outside timber and oil-palm concession boundaries. These non-concession-related fires generated 62 per cent of smoke exposure in equatorial SEA (primarily Singapore and Malaysia). In Kalimantan, non-concession fires play an even bigger role. Fires outside concessions generated 73 per cent of all emissions and 76 per cent of smoke affecting equatorial South-east Asia. These findings are in line with similar results based on more detailed studies in Riau and published in Nature in 2014. In Riau, 52 per cent of the total burnt area in 2013 was within concessions. However, 60 per cent of these burned areas were occupied and used by small and medium landholders. This is also why, I think, it is not possible to stomp out the practice of slash-and-burn altogether. It's not about politics here, but rather the preservation of culture and tradition. For these small-scale, nomadic farmers, slash-and-burn is a way of life, part of their cultural heritage and more importantly, it's their only way of making a living. For them, fire is the single most cost-effective way for clearing land. It's easy to make, cheap, and nature will take care of the rest. Forcing them to abandon the practice for the good of the world is almost like deleting a significant part of their culture and tradition. Good luck in striking a balance between tradition, development, and conservation. As for the concessions, well, you might be interested to know that Indonesia is currently the largest exporter of palm oil in the world, and in order to become the largest exporter in the world, you need a lot of oil-palm, which also means you need a lot of land, and the simplest and most cost-effective way to clear a large piece of land to plant a lot of oil-palm in order to become the top exporter of palm oil in the world is by using, you guessed it, fire. 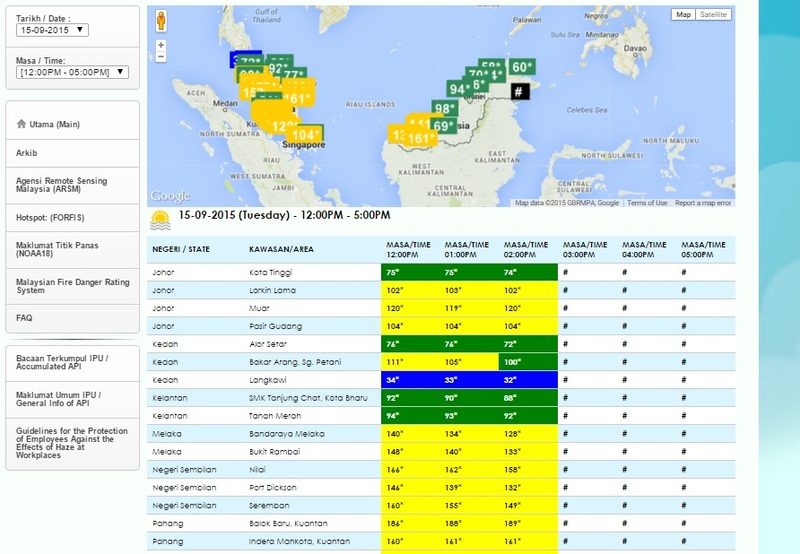 Air pollutant index (API) in various parts of Malaysia on 15th September 2015. Image taken from the Department of Environment website. Apart from the human factor, the climate of SEA also plays a role in perpetuating the haze problem. Indeed, most of the major haze events in history coincide with major El-Nino events. This is because an El-Nino event brings drought to even the wettest parts of insular SEA--a perfect recipe for forest fire--and it occurs every three to five years and could last for several months or even years. Left uncurbed, the haze could pose a devastating effect on the health of those affected by it. The smog often contains harmful level of NO2, CO, CH4 and other non-methane hydrocarbons. During the 1997 haze disaster, a group of researchers from the University of Tokyo, in collaboration with researchers from the University of Shizuoka and the Environmental Management Centre of Indonesia, tested and interviewed 543 people in selected sites in Indonesia, and found that 98.7% of the respondents developed an exacerbation of respiratory symptoms. But the effect of the haze doesn't stop there. Do you know that one of the largest volcanic eruptions in the history of world happened 74,000 years ago in what is known today as Toba in Indonesia? According to a guest editorial published in 2012 by researchers from the University of Oxford, the Toba super-volcano eruption released 2800 cubic kilometers (I triple-checked this, and yes, it's kilometers) of volcanic material which blotted out the sun, reflecting it's ray and cooled the Earth--a phenomenon called a "volcanic winter". In contrast, the 2010 Eyjafjallajökull eruption that paralyzed flights across Europe and the 1883 Krakatoa eruption--widely known as the largest volcanic eruption in recorded history--spewed out only around 0.27 and 12 cubic kilometers of ashes, respectively. Similarly, a severe haze could blot out the sun, reflecting its ray and cools the Earth. In fact, when I was out riding my motorcycle yesterday in the afternoon, I did feel a little cooler compared to normal days, and it wasn't a placebo effect; it's actually backed up by science--a study published in 2001 in the Journal of Atmospheric Chemistry shows that during the haze event in 1994, there was a general decrease in solar and UV radiation reaching the ground compared to the same period a year later. Nonetheless, the damage brought by the haze outweighs its benefit, and I certainly hope the Indonesian government could find a solution--quickly please, even a short-term one would suffice--to assuage the intensifying haze problem. I, for one, do not look forward to another haze-filled summer.